PAOLA: Today I’m interviewing Brian. Brian has been diagnosed with MS – Multiple Sclerosis which is basically an auto-, auto-immune condition where the myelin sheaths of the nerves are inflamed and are being attacked by by the body’s own immune system. And … hm … so we’re gonna talk about that and how Brian used ozone to get MS in check. So Brian, so you were diagnosed with MS 1.5 years ago, is that right? BRIAN: Yeah, back in May 2013 after I had a spinal tap, a full work up of MRIs and blood work done as well. They kind of put all that together [inaudible] to [inaudible] Multiple Sclerosis. So there is not one thing that diagnoses MS, and there is a lot of other things that present like MS so sometimes it can be kind of tricky to diagnose MS. So they kind of put these puzzle pieces together to build the big picture about what’s really going on, or Multiple Sclerosis. PAOLA: So there are different types of MS, right? BRIAN: Yeah, yeah there is primary progressive Multiple Sclerosis, the kind I think I had where it kind of starts out and just gets worse. There is remitting recurring MS where you can have symptoms then they go away and come back then go away and come back so it’s kind of this revolving life of “you feel good, you don’t feel good”. I didn’t have that. Every single day was worse for me and a lot of times that can turn into secondary progressive Multiple Sclerosis. So anyway you look at, eventually things start getting worse and worse as far as I know and I can see it. That’s been my experience for sure. PAOLA: So can you repeat ah … can you repeat real quick the symptoms that you had and what were … when you felt your worst – how bad was it? BRIAN: Mostly the symptoms I had at the beginning were a little bit of tightness in my neck and upper back and a lot of fatigue. I was very very tired and both of those just got worse and worse basically every day for about 9 months and at my very worst I was pretty much on Percocet and Oxycodone and Baclofen it’s a minor muscle relaxer and pain reliever they give to people with MS. So I was on both of those pretty much every day and it didn’t help. I was just pretty much writhing in pain like just a knot. My whole body was in a knot and it hurt a lot. PAOLA: So those drugs were they helping a little bit or not really? BRIAN: Not really, no. They’re basically just pain relievers like the Percocet or Oxycodone. Those are just pain relievers. The Baclofen is a minor pain reliever and a little muscle relaxer and I was up about half way dosing up with that before I did the ozone and then I just quit all those drugs. Those were really the only two that I did. They don’t have any MS medication for anything progressive. So I never got a chance to get onto any of that. PAOLA: Ok, so then you said that a year ago around May or June of 2013 you found out about hydrogen peroxide and you started drinking that in a very diluted form, is that right? BRIAN: Yeah. I have a friend in the LHON community in Buffalo, NY Brandon Ermol, and he kind of introduced me to drinking 35% Food Grade Hydrogen Peroxide and diluted that down in distilled water and start out with 3 drops 3 times a day and moved all the way up to 25 drops 3 times a day and with that the MS went away within 48 hours; and continued to do that for about a month and by June 15th I was done with that and no MS symptoms and all of July no MS symptoms and then July 29th all the MS came back. So pretty much just got worse from there. PAOLA: So then did you did you go back to the hydrogen peroxide or what did you do? BRIAN: I did at first but for some reason it wasn’t agreeing with my body the same kind of way. If you don’t do it the right way, add too little water or all these different things the hydrogen peroxide can make your stomach hurt or feel really sick. So I stopped that immediately and I reached out to my naturopath who I had been working with on my vision for the last 4 years for a naturopathic physician in my area who specialized in oxidative therapy and I went and got an IV of 3% food grade hydrogen peroxide. So I just got hydrogen peroxide straight in the vein and at that time my MS was you know was killing me I was very very tired I could barely walk, you know, so I got up out the chair and I wanted to run up a mountain. It was that quick and that dramatic. And that naturopath also did ozone therapy. So he did IVs of ozone, he did rectal insufflation, ear insufflation, and he also had a hyperbaric oxygen chamber. So he was the oxidative therapy king of this area or whatever [laughs]. He had all the different therapies you could do in oxidative therapy and stuff so for the UVBI didn’t do any of that but I did an IV of the hydrogen peroxide and ozone and he finally got me to do the rectal insufflation ozone therapy and just being the young guy that wasn’t something I wanted to do so it took me a couple hundred dollars before I broke down spinning and running on other therapies, IVs and stuff like that so I didn’t have to do the rectal insufflation and when I finally did it was less than half the cost and worked 3 times as well. So I did that for August this year, September this year, last year I’m sorry excuse me, August, September, and in October I just kind of ran out of money and ability to get to his office … and from October 2013 to March 2014 my life kind of ended. It was all about MS. Trying to live with my symptoms. And I had to quit working in October and basically didn’t do anything until March 23rd. After I had my own ozone equipment and did my own ozone treatments on my schedule as much as I wanted and I’ve had zero zero MS symptoms since March 23rd, 2014. PAOLA: So tell me about that first set the first equipment that you had because from what I understand it wasn’t really meant for medical purposes it was just some … for air purification, yes? BRIAN: Air purification, water purification stuff like that so I bought an ambient air ozone generator. It just uses air from the room and creates the ozone that way and they sell that on amazon for $300 and that’s what I had and I knew that the ozone or hydrogen peroxide oxidative therapy just made my MS go away. So it was highly important that I get it, I needed it. And i didn’t buy the right equipment. So March 23rd I stuck that tube in my ear to kind of do ear insufflation uhm and what basically that machine that’s not the right stuff and the sticking the tube in my ear which is not necessarily the right thing – I was fine. Like 45 min later, it might have been up to an hour later, but I got up and I could just walk. At that point I couldn’t move without a cane or walker, so my walking was incredibly bad. I had to lean on everything, I couldn’t stand for more than a minute, if I could stand for a minute just stand in one place. So that machine was something I could afford at that time and I kind of needed to prove to people in my life that ozone was gonna save my life or at least help me for now; and they saw that it would and it did and I got a little bit of help getting the right medical equipment; so now I have all the right stuff and been doing the right treatments with the right equipment for about 7 months now and I’ve been MS free since. PAOLA: So so the first machine that you bought you knew that it wasn’t really the right medical equipment but that was all that you could afford at that time and you just gave it a shot with the best you could do? PAOLA: So how long has it been now since you since you had the right medical machines? BRIAN: About 6.5 months so it’s only 2 or maybe 3 weeks after I did the first treatments with the wrong machine and March 23rd 2013, 2014 excuse me, uh the last year has been a blur, so it’s been 7 months with absolutely no MS. No fatigue, no tiredness, no spasticity. One thing felt like I needed to crack my neck all the time, it was just all cinched up and it hurt – I haven’t felt like that for about 6 months at least. All kinds of things that like your body feels loose and good and you have energy, so it’s been 6 months with the right equipment. PAOLA: So tell me again what applications did you do with the with the right medical machine, the synergy, let’s call it the synergy. So you say it was rectal insufflations and ear insufflations, is that right? PAOLA: So, how quickly after doing ozone, how quickly after doing an application either the rectal insufflation or the ear insufflation do you notice positive results? BRIAN: Uhm, well with the MS I’d say at least 80% gone symptom wise within an hour. So it was I’m bed ridden for the most part … I use that term a little loosely but you know I could move from my bed to the couch or to the chair things like that but being a normal human being wasn’t possible. So I went from that with the wrong machine I stuck in my ear for about a minute and that was coming out of it like 5 liters per minute so it’s definitely the wrong thing to do, but within an hour I was running up and down the stairs; so it’s a huge huge huge difference. And uh … I don’t know [laughs] … it was pretty quick. PAOLA: So, ok ok, you said that you mostly do rectal insufflations now and very very little ear insufflations if any at all, uhm now how long how long does one ozone application last? Like after what time do you start sensing symptoms coming back so that you have to go back and do another application? BRIAN: Well, it’s not like that anymore. Like I said I do about this month I’ve done 4 insufflations so once a week … uhm … at the beginning I could notice the MS symptoms coming back now I cannot. If I stop doing ozone I don’t know if the MS would come back but I’ve slowed way way down and it hasn’t. Uhm when I first started I was doing it twice a day because if I didn’t do it at least every 3 days I could tell the MS was coming back and I could feel most of the like tightness and fatigue, spasticity I guess. So it would it would be about 3 days or so. When I was seeing a naturopath last year he’s only open twice a week so that was pretty difficult but it was like a rollercoaster “I feel really really good and then I’d fall down and I’d see him again and I feel really good” and it went on like that for about 2 months in September and October of 2013 and I just don’t notice that anymore. It’s like the MS is 100% completely gone. But I can’t prove that [laughs]. So I continue to do the ozone therapy but it’s not anything I have to do. I haven’t stopped for like 3 months or 6 months and seen what happens but why would I do that? I feel good, MS is gone, I have all the equipment I need you know so I would keep up the treatment and hey if MS never comes back then I’m happy with that [laughs]. PAOLA: Now did you have any negative reactions to ozone? PAOLA: Ok, now if you go back and look back at the worst time when your MS symptoms were at the worst and if you would have to say on a scale from 0 to 10 where let’s say 10 would be like you know absolutely the worst point where you were and 0 would be no symptoms and you were feeling great, so at the worst time on a scale from 0 to 10 where would you say were you? BRIAN: Uhm … back in March 22nd was the last day that I felt bad cause of MS and I would say that was a 15 not a 10. BRIAN: I couldn’t even get out of bed. It was really really hard to get out of bed and I kept my cane in the side rail along the bed so I could reach down and get my cane and help myself out of the bed. And by March 27th I felt like a negative 15. Fantastic. And I’ve felt that way ever since. So it didn’t go from a 10 to a 0 it went from a +15 to a -15. Such huge HUGE difference. It’s really really insane how much oxygen has saved my life. [laughs] It … that’s the only way I can put it that it’s ozone saved my life. And it’s nothing else I can say about it. PAOLA: That’s pretty remarkable. So have you, so so basically ozone and hydrogen peroxide those are the only things that you tried for MS, yes? PAOLA: So have you seen that doctor since? BRIAN: Uhm yeah I went and had another set of MRIs: brain, thoracic, and the spine on September 22nd and that’s 6 months after doing ozone so I had no symptoms for 6 months and then I went and had another set of MRIs and those MRIs show that there are no new lesions that are no active lesions, or enhancing lesions that’s what technically we would be calling them but active I guess you can say, and there is no MS symptoms. My doctor he “push, pull, squeeze the hands, stand on one foot” you know all the different little MS stuff that you would do with your doctor, he can’t tell that I have MS anymore. And my images show all the lesions that I did have which is pretty extensive, the whole back of my head is covered in lesions, so much that it formed like a lake. I had two new ones up on the front of my brain on the last set that I had. So every set of MRIs I’ve had showed more lesions, more damage, everything just more and worse for the last year and a half and then just last month in September no new lesions, no active lesions, my doctor can’t tell I have any MS symptoms, no spasticity, none of that, and I feel amazing! [laughs]. So MS completely gone. I did stop the progression because there is no new lesions and I spent less than a thousand dollars on this stuff, and I have catheters for like a year, I have lubrication I have everything I gonna need for a year for less than a thousand dollars. I spent more than that just on co-insurance and co-pays in the last year and absolutely nothing was done for me. He argued with me [laughs]. PAOLA: Now have you ever asked your doctors why why they think you started having MS to begin with? PAOLA: So, I I’m sorry, your friend who introduced you to hydrogen peroxide he had the same thing, yes? PAOLA: And so he, so he, so he … got his, I’m sorry, there is something going on here in the background, he got his the … his condition of the neuropathy of the optic nerve, he got that in check with hydrogen peroxide is that right? BRIAN: Yeah, yeah, that’s why I’m here [laughs]. So I haven’t had any vision improvements with the hydrogen peroxide therapy that I’ve done and the extent of ozone therapy that I’ve done. The oxidative therapy has not helped my vision but that’s ok, I’m not dead. [laughs]. That was the path. It was who cares about being blind I’m dying. It was that serious cause my whole body was shutting down. I was, the only way I can describe what was happening to me is “I’m slowly dying”. And there not really anybody in the medical field who can argue with that because they know what happens to people who have progressive MS whether it’s primary or secondary. You can have remitting recurring MS for like 40 years and eventually when you’re older it turns into progressive MS until you’re dead things get worse. In my last appointment on September, October 1st at the very beginning of this month I went to the doctor to go over those MRIs that I had September 22nd and found out that, this is a little [inaudible] my mom had actually told my step dad that she didn’t think I’d be alive by the end of this year that I might die within the next 3 months, that’s how bad it was. PAOLA: Right [laughs]. Brian, have you ever looked into mercury and the connection between mercury and multiple sclerosis? PAOLA: There is something I wanted to ask you: Have you ever had mercury fillings in your teeth? BRIAN: No, no I haven’t had mercury anything except for what would be in like a vaccine or the flu shot or something like that. So that would be the only way that I would take mercury into my body unless you know it’s in the environment somewhere and it’s something I don’t know about. PAOLA: Right. So but you are you’re not totally blind or are you legally blind or you can see a little bit, yes? BRIAN: Yeah, I’m a … my right eye which is my good is 2300, which is legally blind, 2200 means you’re legally blind, and my right eye is 2700. So this eye before I started all of my … before MS even came into my life I took over 15,000 Vitamins to try to get my vision back and changed my whole life. I stopped smoking cigarettes it’s like everything. It was insane the amount of stuff that I’ve done to try and get my vision back and LHON is another one of those diseases where there is no treatment, no cure, there is nothing they can do for you. So I did the research and came up with my own kinda Vitamin cocktail and took that for about 3 years. There was no MS nothing until about a year and a half ago and uh … I don’t know. So the MS came out of nowhere, really. PAOLA: Ok, are you saying that the Vitamins might have something to do with the MS or – I’m not quite sure I understood. BRIAN: The vision, gaining vision back so that’s something I have been doing for the last couple years is trying to gain vision back from the vision loss of LHON through Vitamin therapy. I took I said like 15,000 Vitamins over 3.5 years 3 years, so that was something that I was doing for a couple of years and then the MS came. So it pretty much shut my life down when I was diagnosed with MS.
PAOLA: Ok, but you’re not saying that the Vitamins might have something to do with the MS coming on, that’s not what you wanted to say? BRIAN: No. That’s not what I’m saying. No. PAOLA: Well this is, this is really an absolutely remarkable story and uh … so is there anything else you would like to tell people who suffer from MS? BRIAN: Find yourself a naturopathic physician or naturopathic doctor, an oxidative therapist whatever they’re called where you at and go see them, go see them quickly. I wanna set up a booth with all my equipment there at like the Walk MS and all the different events for MS and stuff and just let people try it for free because it’s not necessarily gonna hurt them, there is no real side effects from ozone if you’re not a dummy, you have common sense and you do it the right way, at the right amount at the right time – no side effects that I know of. You can have side effects if you do it badly or wrong so I wanna just stand at a place where there is hundreds of people with MS and just scream about this stuff it’s that important to me. But that won’t happen [laughs]. Especially here in America. So that couldn’t that couldn’t happen but I ran into a couple of people in my personal life who have been diagnosed with MS. They’re going through the diagnosis, they’re experiencing symptoms and a lot of them have reached out to me to inquire about the ozone therapy and they check out my machinary and all that kind of stuff. I would say find somebody who can give you oxygen. It’s that important. If I might may in all of my research – and research is one of the things I love to do most – MS might not necessarily be an auto-immune disease. I kinda put it like this: if you’re gonna see a PhD, a doctor in a hospital, white coat, they’re more than likely gonna tell you: MS is an auto-immune disease like we kinda started this call. If you go see a naturopathic physician, or a naturopathic doctor an ND, they might say MS is caused by a virus and go even further than that if you gonna see a naturopath who has a lot of experience and knowledge of LHON, especially LHON Plus they might say MS is caused by a virus in you as well as a genetic pre-determined condition that MS is going to happen. So it could be really really evolved and the main point is “nobody knows”. There is no one who is 100% A-Z about MS. That really frustrated me while I was dying slowly. The doctors they just yeah agreed with everything I said like symptom wise and stuff like “yeah, ok, cool your legs hurt” there was nothing done for it. So MS might be a virus and if MS is caused by a virus or at least in part by a virus there is no wonder ozone just fixed it. And I try to say: this is one of 3 things: this is either magic that made my MS go away, this is a treatment for MS, or this is a cure for MS and I don’t care which of those 3 it is. It could be any one. It could not even be on that list of 3. I don’t care because I feel good. And that’s what was really important because as you said how do you feel 0 to 10 I said 15, I felt really really bad I was dying more and more every day – not anymore. It’s completely gone. I have no MS symptoms and my brain doesn’t look any worse at all. There is nothing going on. So oxygen. The hydrogen peroxide that I drank was from Guardian of Eden and it was called Jutrian Rx and I bought the blue Jutrian Rx Blue. And that cost me $87. So for $87 the first time I got rid of MS for about 2 months, drinking the oxygen basically. And doing rectal insufflation ozone therapy for the equipment and what I needed to do that was about $800. So for that a year’s worth of MS being gone you can’t find better money for like care anywhere on the whole planet that I know of. So if you have MS it’s it’s really important that you check it out because it’s not something that is going to hurt you and it might be something that could make your symptoms just melt away in minutes. Again: magic, treatment, or cure – don’t care. Cause I feel good. And that’s really what’s important because you watch videos on youtube of people with MS of any variety – they don’t feel good and they’re not happy. It’s not a good thing and it’s really depressing when you don’t feel good and you’re not happy and you watch other people and next month is gonna be worse and I’m gonna be less happy and 3 months from now, 6 months from now, like every way you look at it is really really bleak. So to do something like this oxidative therapy or ozone and just have the whole world change within an hour or minutes it’s incredible. So I definitely recommend ozone therapy to most anybody who has any kind of ailment. Does your back hurt? Do ozone [laughs]. My mom has a problem with the sciatic nerve she does ozone therapy, she does ear insuflation only and it helps her she does it like every 3 days and she’s she’s a lot better. I wouldn’t say it’s fixed anything but she feels better. My stepdad has a lot of problems in his back and I bought him a ozone sauna bag so he’s gonna start doing that and he does ozone ear insufflation and stuff as well so pretty much my whole family has gone on the ozone train. PAOLA: … we’ll stay in touch. BRIAN: Can I ask you to post a link to my video? 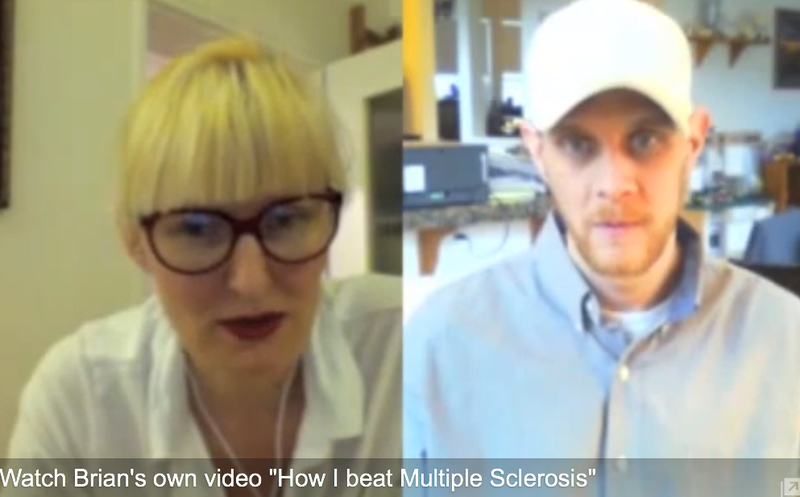 The one that I just posted “How I beat Multiple Sclerosis on youtube”? BRIAN: [inaudible] description or something just kinda share, get more information out there. PAOLA: You mean the one that you posted first on the “ozone to health” Facebook group? BRIAN: Yeah. Just like uh 2 weeks ago? PAOLA: The one with the workout in the beginning? PAOLA: OK, one more thing I just wanted to add: what you described what happened to your ears those crusts and those kind of things, this is really a very typical die-off reaction. And so the theory goes that as long as ozone is killing something off or oxidizing something your body will basically will try to get rid of it and so it’s uh it can show up as like those crusts or liquid that is coming out of your ears and that can turn into a crust or the ear can also become inflamed temporarily. So this is a very very typical die-off reaction after doing ear insufflations and it can become extremely painful and there really, other than the pain there is no damage that can happen except if the flow of the oxygen is too high then one can blow one’s ear drum, that can happen. That’s why it’s important to do it at a lower flow. PAOLA: Yeah, I mean you’re really lucky that nothing … that you didn’t blow anything! BRIAN: [inaudible] only one time … So that was one time and then I got like send that back and got the right equipment, so … everything’s working fine. PAOLA: Alright, great. Alright, so let’s stay in touch and uhm and thanks again. BRIAN: Awesome. Thank you, Pola. I appreciate it. Pola,Brian needs to do rectal 5 times a week ,2-3 months 26 gamma to 40 gamma, as Dr Silvia menendez and the Cubans reversed by 80% glaucoma. also Dr kondrot the ozone eye doctor micro current specialist in Florida. he needs to understand stealth bioweapons he’s not out of the woods yet Dr Garth nicholson and frankly in his condition I’d be on chlorine dioxide one hour after taking zymessence systemic enzymes on empty stomach, in between the DAILY ozone.for a complete pgm http://WWW.cdautism.com. yes its also for non autistic people read the amazon comments for the klinghardt endorsed book Healing the Symptoms Known as autism,I’d add ozone to the protocol. I agree, he might not be out of the woods yet. But he’s got his own equipment now at home so he can continue whenever he wants at his own pace. I’m also not in the position to tell him or anyone else what to do – I’m not a doctor. As to chlorine dioxide – I don’t think it’s a good idea to take a compound which has proven to cause birth defects in infants and anemia: https://www.tlch2o.com/courses/Chlorination404.pdf . especially since ozone is a much stronger oxidizer than CD without all those nasty side effects. And I personally would also do more ear insufflations and IVs if I was Brian – to get the ozone directly to the area that needs treatment, the brain. Rectal insufflation seem to do the trick but there is no way of telling what results he would get with the LHON if he addressed the brain directly more often. As to Klinghardt: I can tell you at least 4 people I know who went to Klinghardt and did not get well or only marginally. But their pocketbooks certainly got smaller. Guy charges $3500 for the first consultation – I would expect some better results and better research at that price. I’ll pass on the other names to him. It would be great if his vision improved. Im doing the CD for about 2 months for MS. I will be starting the ozone therapy next week. Is there anything else i could do? if with CD you mean chlorine dioxide i would be very careful with it. it’s been shown to cause anemia and birth defects in fetuses. ozone and h2o2 (hydrogen peroxide) are stronger oxidizer than CD and leave no toxic byproducts. if i had MS i would look into amalgam removal or root canal removal (if there is mercury at the tip of the root canal which around 40% of them have if you live in the US), or if you have metal crowns to check that they were not placed on top of amalgams. also if you were ever vaccinated – in all those cases i would look into the andy cutler/frequent dose chelation (only after amalgam removal or other mercury containing dental work!!!). i would also look into the paleo diet or ketogenic diet. at the very least to cut out sugar, grains and milk products. http://Www.jimhumble.Is. Look at the 21 People recently cured of ebola by Chlorine Dioxide on the newsletter. Dr.Robert ROWEN uses chlorine Dioxide he an ozone pioneer in Ca. In between rectal oxone,i would to chlorine dioxide .plus mms2,Done every 2 hours 5 times a day.in my opinion,i would go low and slow WITH mms1 and mms2.i would maintain a low herx effect by eating green apples or apple pectin.also bentinite clay and psyllium husk tigether in water,done when needed.i also would to dr wongs. Zymessence on empty stomach. If you need convincing that meat is an essential part of our diet, there is one essential nutrient that is not found in any plant food but only in foods of animal origin. That nutrient is vitamin B12. The most important deficiency for anyone not eating foods from animal sources is that of vitamin B12. By definition vitamin B12 is essential to human life. It is essential for the synthesis of nucleic acids, the maintenance of the myelin sheath( the insulation around nerves which, when damaged, causes multiple sclerosis); indeed, its prescence or deficiency affects nearly all body tissues, paricularly those with rapid dividing cells. Without vitamin B12 we suffer from pernicious anemia which is deadly, and degeneration of the nervous system. Vitamin B12 is unique among vitamins in that while it is found universally in foods of animal origin, where it is derived ultimately from bacteria, there is no active vitamin B12 in anything which grows out of the ground. Where trace amounts of vitamin B12 are found in plants it is there only fortuitously in bacterial contamination of the soil. And even that is lost if plants are washed thoroughly before eating them. Bacteria in the human colon makes prodigious amounts of vitamin B12. Unfortunately, this is useless as it is not absorbed through the colon wall. Dr Sheila Callender tells of treating vegans with severe vitamin B12 deficiency, by making water extracts of their stools which she fed to them. thus effecting a cure. An Iranian vegan sect unwittingly also makes use of this fact. Investigators could not understand how members of this sect remained healthy, until their investigation showed that they grew their vegetables in human manure – and then ate the vegetables without being to fussy about washing them first. To enable vegans to survive, vitamin B12 is added ‘artificially’ to breakfast cereals and may be bought in pill form. This is hardly a natural way to get food and it can be self-defeating. Unlike most vitamins, vitamin B12 occurs as a number of analogues, only one of which, ‘cyanocobalamin,’ is active for humans. In collecting human stools for analysis, Dr Victor Herbert found that of each 100 micrograms of vitamin B12 extracted, only 5 micrograms was of the cyanocobalamin analogue. Thus even in this prodigious source of the vitamin, 95% was composed of analogues which were useless. Several fermented products such as tempeh, a soybean product, and spirulinas, used by strict vegans as a source of vitamin B12 either do not contain significant amounts of the vitamin or contain analogues which are not active for humans. Over half the adults from a macrobiotic community tested in New England had low concentrations of vitamin B12. Children were short in stature and low in weight. The community relied on sea vegetables for the vitamin. This reliance on vegetable sources gives a false sense of security and could actually bring on vitamin B12 deficiency more quickly. The amount of vitamin B12 we need is tiny: about one microgram per day. Eating more results in reserves being built up in the body. When a person becomes a vegetarian, those stores are depleted-but only gradually. Thus it can be several years before the onset of symptoms. In England a carefully conducted study carried out on vegans showed that they all developed vitamin B12 deficiency eventually. There is one other hidden danger. A largely vegetable-based diet provides large quantities of folic acid, which works in conjunction with vitamin B12. The two need to be balanced, as excess folic acid can disguise vitamin B12 deficiency in the body. In such a case irreparable damage to nerves and the spinal cord can take place that, by the time the symptoms become apparent, death is inevitable. What matters as far as humans are concerned is that foods of animal origin are the only reliable food sources for vitamin B12. This provides further evidence that such foods have featured in our diet for a very long time. Thanks for bringing up B12! I don’t know the context of why you brought it up, but I am VERY interested in knowing if Brian was supplementing his ozone treatments with some B12. After recently watching a Youtube video of a young woman who recorded herself immediately after her very first ozone insufflation, I have started wondering about what an ozone generator does with the 5 to 10% nitrogen that comes out of an oxygen concentrator. The woman in the video mentioned that her oxygen concentrator began “making a funny noise” during her treatment. Four or five minutes into her video, she began laughing and said she felt “high”. I don’t know much about chemistry, but I suspect her ozone generator was not only splitting the oxygen (O2), but was also splitting the nitrogen (N2), thus resulting in some very reactive single O’s and N’s. In Brian’s case, however, I wonder if part of the “magic” in his beating MS was not just from the ozone (O3) being produced, but from nitric oxide (NO) perhaps being produced, as well. From what I read, nitric oxide is truly amazing stuff, but its success largely depends on having enough B12 in order to do its thing. They say that having too much nitric oxide is a bad thing, but I am wondering if the key is just making sure your body has enough B12 to work with the nitric oxide?? oxygen concentrators do not split o2. they just filter out all the other gasses contained in the air, except oxygen. so the end result is a gas which contains between 90 and 97% oxygen, the rest being nitrogen, argon and CO2. i don’t think one can tell by the noise an oxygen concentrator makes, what gas it puts out in what concentration. ozone is known to elevate the mood – that might account for her laughing and feeling high. it’s a natural occurrence with ozone therapy. vit b’s are a agreat addition to ozone. they work synergistically. I like the longevity machines, you can get the EXT 50 for around $900. I also have a synergy WPS-100 which I’ve been using for years, you can get that for under $400. Join the Facebook group “ozone to health” or “ozone, chelation and paleo diet” – there are files with whole packages. Or I can send you the files via email, if you want. Hi Pola, here Lorenzo, in Singapore. I have MS, that was quiet for over 14 years. two years ago stress activated it and make symptoms appearing and remaining, day by day slightly worse in up and downs. I’m getting quite crazy. I tried many things so far, some worked little bit, some not. I’m on strict diet no diaries, lot of vegs, no meats, no alcool, no smoke, Vits intakes and high dose VitD protocol commenced 5 months ago. But it just make MS milder, not stopping it (yet). I’m very interested to do O3 therapy cause in Italy i was doing O3 injection in the neck to cure the C4-C5 hernation and upon 40min-1hour after injections I commenced feeling the effects, with well being feeling and all symptoms (left hand numbness, tiredeness, legs stiffness) disappearing for about 1-2 days, then slowly coming back to original until the next treatment that was scheduled once every 2 weeks… too little and too costly…. This demonstrates to me that O3 works for MS, with merely 4 spots injections in the neck muscles at that time, per application….. I guess results can become more stable and permanent with home-base rectal O3 insufflation therapy…..
Hi Lorenzo, in order to do safe home ozone treatments you’re gonna need an oxygen source like an oxygen concentrator or an oxygen tank filled with pure oxygen. Can you get that where you are? As to which o3 concentrations to use: are you on facebook? If so, there is a group “Ozone to health” with all the info you need. There you can find a document which lists all the recommended settings for the different applications. With rectal insufflations there are 2 different ways to go about it: either with a bag or without. Depending on how you do it you chose different settings. Let me know what else you’d like to know. there is a low flow oxygen concentrator on promolife.com. If you join one of our FB groups you get also a discount from them (just FYI: neither I nor any of the other admins benefit financially from any sales on any equipment). They sell the o2 concentrator for around $700. A video which might help you with RI without a bag is this one: https://www.youtube.com/watch?v=Nlk2RGlI8XM . How about IV of ozone for MS? I’ve heard it effective from radio host Joyce Riley and Larry Nichols with their 4th and 5th stage cancers. So how about MS? I think it’s definitely worth a try. If I had MS I would most certainly do IVs as a first option. How about ozone IV for MS? Heard it effective on 4th and 5th stage cancer from radio host Joyce Riley and Larry Nichols? How about MS? Heard of Vitamin D study for MS from Cambridge today. Have known about Dr Coimbra of Brazil and his using like 70,000 IU a day for MS. I had tried 100,000 per day for a month or two 3-4 years back. Got superficial blood clot from it. Took vitamin K2 also so had no calcium blood problem. In fact my numbers were quite normal at just less than 100. Going back to 50,000 per day now- can’t hurt really… and I get 50,000 caps from ‘Scriptures For America’ $30 for 100. Just do couple more ozone IVs. Although I have good veins that can easily be seen- they can’t take to many more with out collapse. Will buy Synergy 100 and do rectal. Cost of ozone IVs too. For RI’s, what are the settings you use on the synergy 100 and oxygen? on the synergy I always keep the volume knob at the maximum level and do the RI directly without using a bag at 1/8 to 1/10 LPM and make sure to not introduce more than 500ml at one time. So if I do it at 1/8 LPM, I let the gas flow in for maximum 4 minutes. At 1/10 LPM for maximum 5 minutes. It’s now 2018 and how is Brian? Brian is on Facebook. Join the FB group “Ozone to Health”, you can meet him there and ask yourself. It seems he is still doing pretty good. He picked up the ozone treatments again at some point.